State wildlife officials caught and killed a sick bighorn sheep from a Boulder City park on Sept. 4 so they could run tests to determine if one of Nevada’s most important herds has been infected with a deadly strain of pneumonia. About 10 sheep have turned up dead in the River Mountains between Henderson and Lake Mead so far this summer. Most of the carcasses were found at the northern end of the range. Several of the dead animals tested positive for a type of bacteria associated with pneumonia, but that isn’t enough to prove an outbreak of the deadly illness. State wildlife veterinarian Dr. Peregrine Wolff said the only way to know for sure is to euthanize a sick animal and test all of its tissues. Wildlife officials should have their answer within the next week or two. 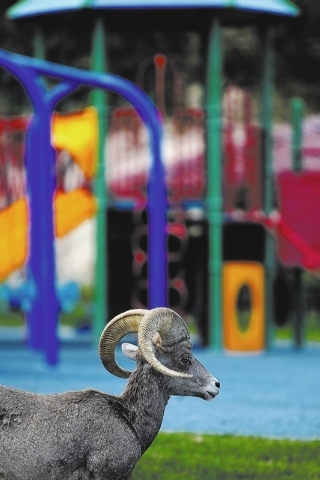 With Wolff overseeing the operation in Boulder City’s Hemenway Park on Thursday afternoon, a ewe born within the past year was shot with a tranquilizer dart and taken elsewhere to be humanely euthanized and dissected. If the worst fears are confirmed, the once-healthy and successful River Mountains herd could be ravaged for years to come by a disease with no real treatment. Bighorn have no natural resistance to pneumonia and tend to die at a high rate. Those that survive become carriers, infecting and eventually killing newborn lambs in a cycle that can diminish a herd for up to a decade, if not wipe it out altogether. Some sheep from the River Mountains also have been sent out of Nevada to help re-establish herds in other states. A fatal pneumonia outbreak would likely end the practice for the foreseeable future. So far no dead sheep have turned up in Hemenway Park, which serves as a regular gathering place for about a third of the herd’s 220 adults. But biologists and members of the public have spotted sheep in the park with obvious signs of illness, including coughs and runny noses. A more serious crisis is playing out in Mojave National Preserve in California, 100 miles southwest of Las Vegas, where wildlife managers briefly considered — and then reconsidered — the wholesale slaughter of bighorn sheep to stop the spread of the disease, which does not pose a risk to humans. The Mojave outbreak first cropped up on Old Dad Mountain, about 15 miles from Baker, Calif., but last month more diseased bighorns were found in the Marble Mountains, about 30 miles to the south. The disease has wiped out about half of the Old Dad herd, but scientists believe it might be waning. The outbreak in the Marble Mountains, just south of Interstate 40, is still in its early stages. The afflicted animals are part of what has been called the biggest and healthiest herd in Southern California. Transplants from the group have been used in the past to bolster struggling herds elsewhere in California. If the River Mountains sheep also have pneumonia, tests on the Hemenway Park animal could determine whether the illness spread to Nevada from Mojave National Preserve. But Wolff said that’s highly unlikely, considering the distance involved and the way the River Mountains are hemmed in on all sides by cities and roadways. Bighorn sheep once roamed nearly every mountain range in Nevada, but unregulated hunting, habitat loss and disease spread by domestic livestock reduced the population to about 1,200 animals in a handful of areas, none of them north of Ely or west of Hawthorne. The River Mountains serve as the main supplier for the repopulation program. Of the nearly 2,900 sheep captured and relocated over the past 45 years, more than 800 came from that range. Bighorn sheep now roam every range in Clark County, including all the mountains surrounding the Las Vegas Valley. There were enough animals statewide to allow for a record 250 hunting tags to be issued last year, Nielsen said. Wildlife officials don’t relish euthanizing bighorn sheep, but it’s part of the job. Henry Brean is a reporter for the Las Vegas Review-Journal. Contact him at hbrean@reviewjournal.com or 702-383-0423. This story first appeared in the Review-Journal on Sept. 6.